Earlier today, Kim and I and the kids went out into the woods and marsh in our backyard on a “bear hunt.” We’ve also gotten into looking for shed deer antlers – as I’ve written about before – so we were doing that, too. But aside from deer tracks in the crusty snow – which Tori identified correctly, by the way – all we saw were a few tweedy birds. Not that any of us were complaining about a nice hike on a sunny winter day. As soon as we arrived home, I saw I had a text message. It was from my cousin Kirsten, who lives in Anchorage, Alaska. 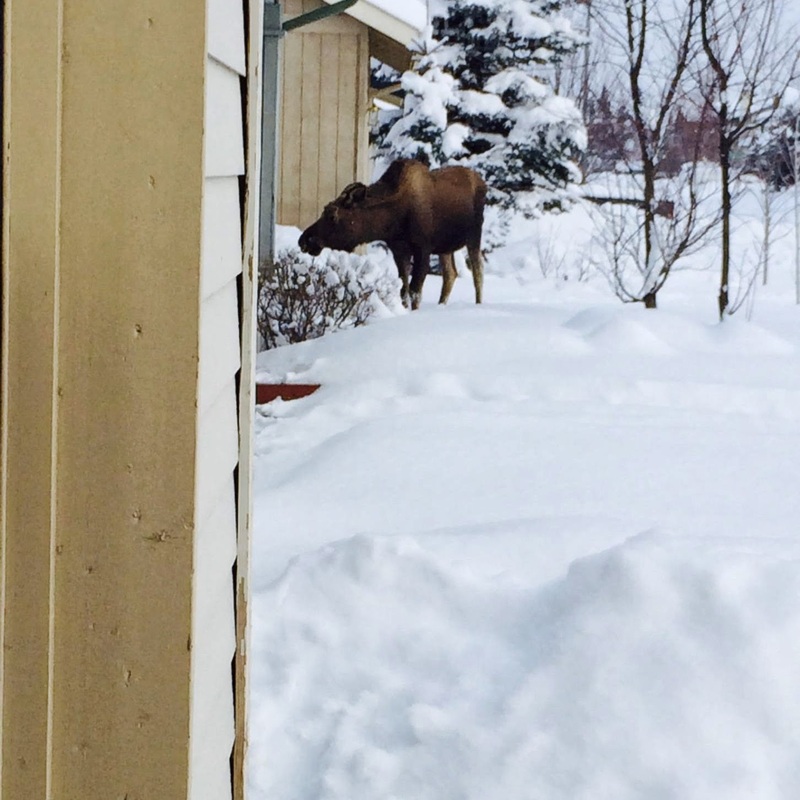 “I’m just trying to shovel, and look who walked up and interrupted my work!” she wrote. And pictured was a big ol’ moose. The thing is, I could search and hunt my whole life, and as far as experiences with wildlife go, Kirsten probably could beat me every time. 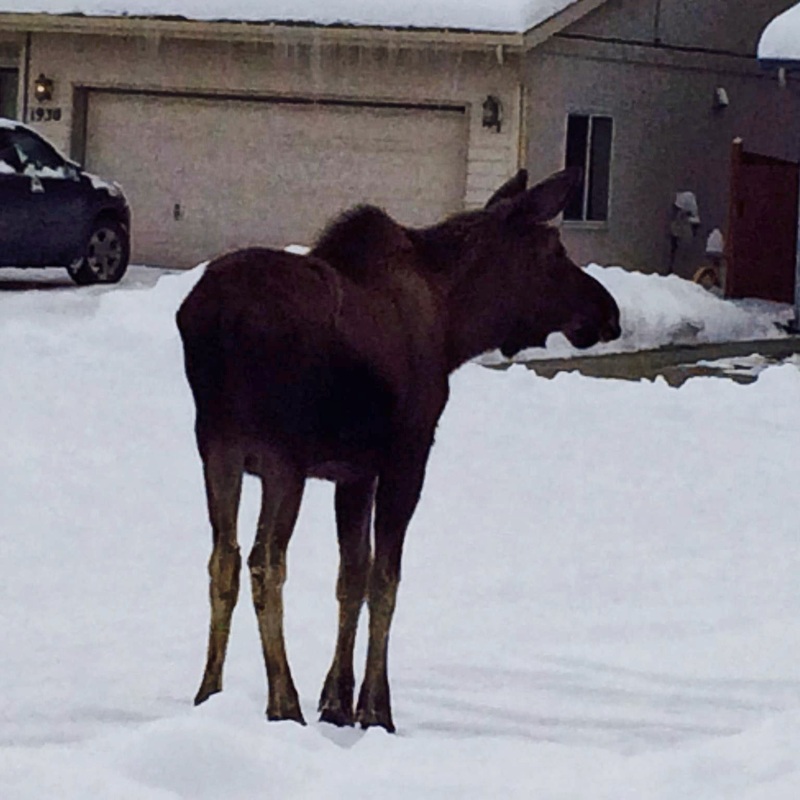 I could see a deer in the backyard, and she’d have a moose in her driveway. It has to be a function of where we live, though, because as excited as I am to see all the bears and moose and salmon she encounters, she’d likely be just as excited if I sent her pictures of the Mall of America. At some point, Kim and I hope to take the kids to Alaska. My family’s trip there in the mid-1990s remains one of my fondest memories. Until then, I’ll just live vicariously through the lens of my cousin’s camera. An update from four hours later: "He's back!"